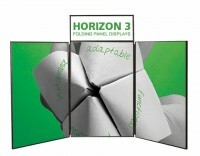 Folding panel table top displays are made of velcro receptive fabric covered panels that fold and stack to make displays of various shapes and sizes. They are popular with schools and other customers who want to use smaller graphics that attach with velcro. They are also useful for customers who need to change portions of their graphics frequently, since it's less expensive to only change sections of the graphic compared with having to reprint the entire display as you would with a full coverage seamless graphic.